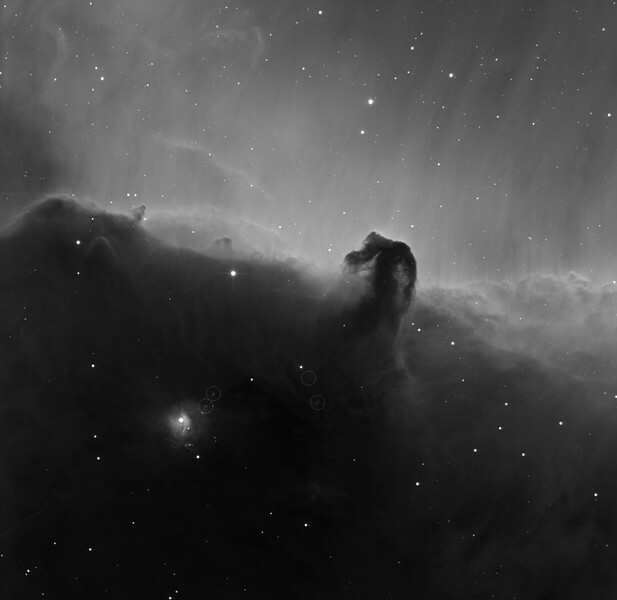 Horsehead, NGC 2023, and 4 Herbig-Haro objects (circled). H-alpha, 6 x 1hr subs. Aspen 16M on 20" PlaneWave CDK on MI-750 fork. Clearly a sea-horse, emerging proudly from the salty spume. Observe the small rhino horn on the horse's nose. Bits of kelp are hanging from the horse's mouth. The horse is observing a Loch-Ness style sea-serpent, riding the breaker to the horse's left. Field 36 min arc, North on the left.